This anime does not stand out as something incredibly unique or amazing, but it is still incredibly well written, animated, and directed. It left me feeling like I had watched an entire 22 episode show, but it only clocks in at 11. I want to watch more, but ultimately the show ends as it should. I honestly recommend this show to anyone who is looking for something really well done that doesn't require a huge commitment! I can't say anything other than this is a masterpiece. The melancholic tone from the icelandic music, mixed with riveting action sequences that had music to get your blood pumping, are simply excellent. The mix of music was so interesting and helped to portray the mood and sequences of the show. Not to mention the, somehow cathartic, and beautifully animated scenes of domestic terror that accompany the music. Also, the characters that get any real screen time have purpose, and develop over the show. This anime packs a profound message while displaying the lives of many characters being affected by it, wrapped in beautiful animation and music. So much to say, so little time! Just wanted to get in my five star rating, but apparently I needed to write a long review. The storyline and animation are both detailed and spectacular. I watched one episode, then a few hours later, I realized I had binged the entire series! I love this anime!!!! I overlooked this story many times scrolling through the list of anime to watch and I'm so glad that it caught my eye this one time.. I watched through the entire thing, Shinichirō Watanabe is a genius when it comes to directing. The only thing that was a let down for me is that I wanted more, I wanted to just keep watching. But nonetheless, it was a great story and I wouldn't change it one bit. This was such a wonderful surprise.Captivated from the first episode. The main protags/antags don't even have proper names just numbers and yet I came to care about them and their story. The plot was not predictable and every episode left me wanting to watch the next. Good story for only having 11 episodes to tell it in. Loved the music. Was shocked that I actually cried at the end. I'll be honest, I don't know really why I chose to watch this. I saw it pop up and thought I'd give it a go. I really enjoyed it. I'm usually more of a fantasy/adventure Anime kind of watcher (something that can really take advantage of the means of animation) so this was against the grain of what I tend to choose. This review is short. Literally just watch it. It's not even going to take that much of your time... Just the beauty in how it was animated is enough of a reason. This is one of those shows that can change your entire perspective on life. So do us all a favor and watch it and spread it. 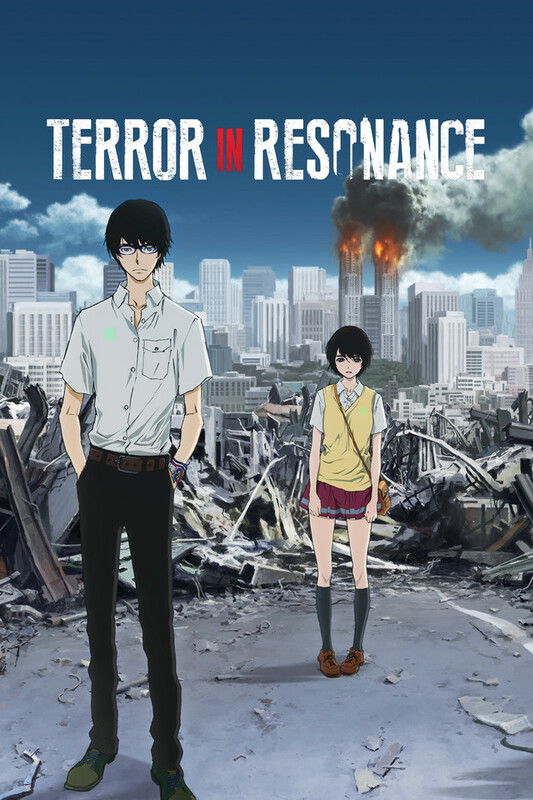 Terror in Resonance began with a really great foundation. The production quality was fantastic. Animation was above-average, voice acting was solid, and visual direction was a joy to watch. Even the sound design was exceptional, along with some vivid and surreal "dream" imagery that made me really want to enjoy this show. I did enjoy it, for the first half, as it built a great sense of mood and atmosphere. But as it began to dig deeper into its characterization and flesh out some sort of theme, it was as if it couldn't find anything at all. The primary antagonist, which is introduced later in the story, is a caricature of a Sunday-morning cartoon villain. Their behavior is erratic and unexplained throughout the series, and even at the end I was still left scratching my head as to why the hell they ever introduced them. The situations the characters find themselves in begin to evolve in ever-more elaborate and implausible scenarios. With any fiction, suspension of disbelief in necessary, but I found my limit being tested as the series dragged on. Thematically, the show simply never delivered. A few themes were lazily tossed around, but ultimately, the show never settled on any actual message. In the end, I kept wanting to know what the point was to the whole plot, but the show seemingly had nothing to say for itself. The show had its moments, but after everything, I just feel like it wasted my time.